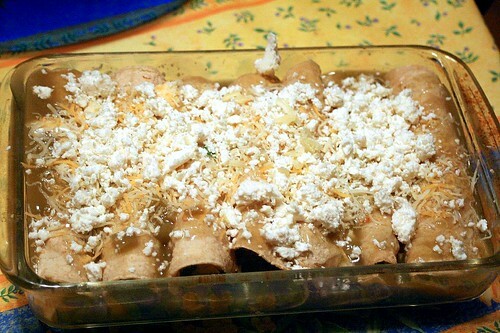 Here’s a confession: I have never before made enchiladas. I only added them to my weekly menu because of what I had in the pantry — enchilada sauce (used in a variety of dishes), corn tortillas, chicken, cheese. But I hadn’t the foggiest clue as to how to turn these elements into enchiladas. Luckily for me, enchiladas are one of the easiest, most adaptable things I had made in a while. They take no time at all to make, can use any number of things from your pantry or refrigerator, and taste fantastic. Even the Nuni liked them, and let me tell you — girl is a PICKY eater. For technique, I turned to cookbooks. A friend had recently sent me the fabulous Rick Bayless’s Mexican Kitchen which has wonderful, complicated recipes for the fantastic layers of flavor that constitute Mexican cuisine, but also some quick pointers for those of us who have jobs that do not entail recreating the fantastic layers of flavor that constitute Mexican cuisine. The method was easy enough — steam corn tortillas, wrap them around some filling that is already cooked, pile in a dish, pour over sauce, top with cheese, and cook in a hot oven until the cheese is all melted and bubbly. 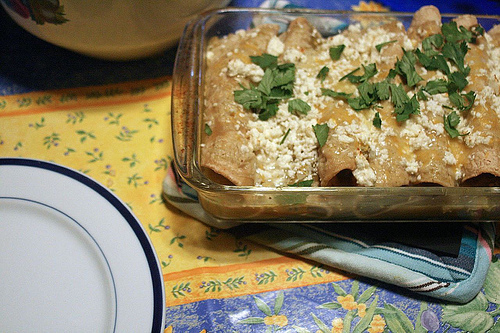 I adapted to what I had in the fridge, and voila — simple, beautiful enchiladas. These will become a staple, even when it’s not Frugal Week. The ingredients list for this can expand to include whatever you want. Me, I had some chicken breast in the freezer which I poached in a little chicken broth with bay leaves and cumin and then shredded (cumin is a quick shortcut that screams “Mexican!” or sometimes “Indian!” depending on context). You could also use any cooked chicken, or any cooked meat, or indeed, no meat at all. I sliced up some of the huge jar of Spanish olives that my husband had so thoughtfully purchased when I sent him out for olives (“Don’t worry! I’ll eat them!” Meanwhile, no olives have been eaten and there is a giant jar of olives in my small refrigerator). Cheese — I used some light sharp cheddar that I had grated, and topped with some more light shredded cheese. I also had some Cotija which I crumbled and used as topping, which is an aged Mexican cheese similar to feta but less pungent. It’s widely available in grocery stores in Southern California – I don’t know about where you live. I guess my husband has a SLIGHT point about me purchasing slightly unnecessary groceries, often in the form of cheese. Cotija is rarely on that “Must Have” list. Hmmmm. Again, you could pretty much use any type of cheese here — goat cheese would be good, as would jack. I would use a good melting cheese as the topper (I used both the Cotija and some of the shredded cheese). Cilantro. Another “Mexican!” ingredient (or “Southeast Asian!” again, context). It adds a nice flavor and looks pretty as a garnish, but if you hate it, leave it out. Those were the basics for my filling, but really, your imagination is the only limit here. Roasted vegetables? Sure! Last night’s leftover taco filling? Why not? Enchilada Sauce. This is another item that is widely available in Southern California grocery stores. You can make your own or substitute in some thin (ie, not chunky salsa) mixed with chicken broth. Or vegetable broth, I suppose. I have no issues with using shortcuts here. Enchilada Sauce is delicious (albeit riddled with sodium, but I am not salt phobic). Also, it makes enchiladas very easy. So there. Corn Tortillas. You do kind of need these. If you’re on some low carb diet, you could pound chicken into very thin pieces and wrap it around cheese, but that would be a whole ‘nother recipe and one I’m just not up for. Especially on a weeknight. I mixed up the shredded chicken, the sliced olives, the shredded cheese and the cilantro, and added a little enchilada sauce to moisten. The amounts really don’t matter here — just eyeball. (I used the amounts pictured). Rick Bayless suggests steaming the tortillas in a steamer basket over an inch of boiling water. Me? I hate doing dishes, so I dampened a clean dishtowel, arrangd it over the stack of tortillas on a plate, put the whole shebang in the microwave with a glass of water, and microwaved on high for about a minute. Worked like a charm. 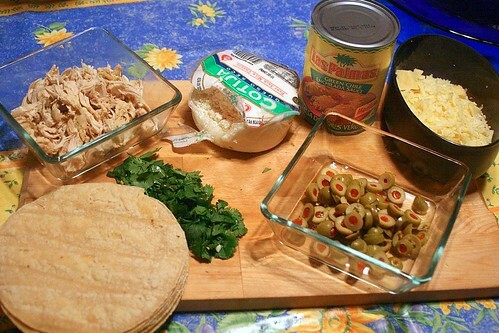 I rolled up the filling in the tortillas, placed them seam side down, poured the remainder of the (15 oz.) can of enchilada sauce, topped with a little more shredded cheese and the crumbled cotija. Baked in a 425 degree oven for about 10 minutes, or until the cheese was all melty. As I said, this one’s a keeper.